Smitten Polish Blue Holo Extravaganza!!!! And a Green Holo for Comparison!! First up, I have Blue Footed Booby Dance--a vibrant turquoise linear holographic! The formula and application were both fantastic with this polish and the swatches below show 2 generous coats on its own. I loved this polish for the day Noelie posted sneak peeks on her Facebook and this does NOT disappoint in real life! Next up is Bifrost--a stunning midnight blue linear holo. Again, no issues with application or formula and the swatches below show 2 coats on its own. For those of you who love rich, dark blues, this one is a MUST-HAVE! I was blown away by how gorgeous it is! Third, I have for you, dare I say, my personal favorite of the blues, Out of the Blue--a fantastic, bright aqua blue linear holo! Both application and formula was perfect and the swatches below show 2 coats on its own. I am so, so, SO in love with this color and the holo in this polish!!! And finally the comparison you've all been waiting for! 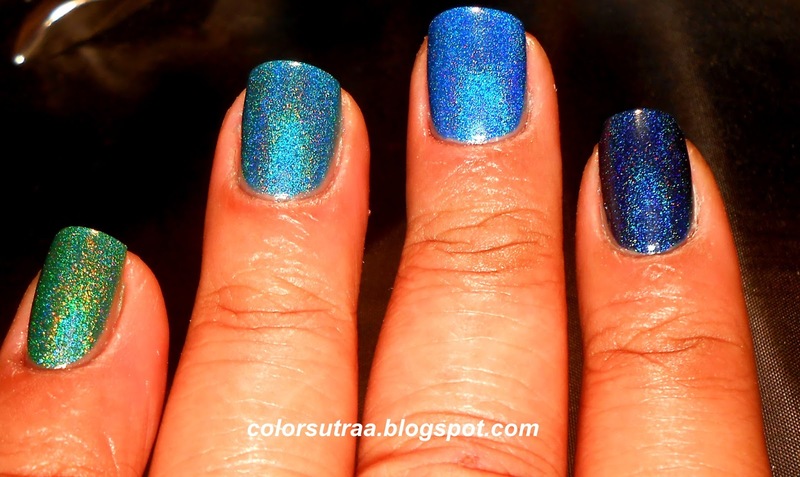 From left to right, the pic below shows 2 coats of Bifrost, Out of the Blue, Blue Footed Booby Dance and Enchanted Forest on the index, middle, ring and pinkie fingers respectively! So there you have it, my darlings! If you need to add any of these blue beauties to your collection, and if you ask me, you DO,you can find them HERE for $11.00 for a full-size, 0.5 oz bottle of holographic polish. Now, many of these are currently out of stock but you can follow Smitten Polish's Facebook page for the latest information on restocks! Do you have a favorite from these blues? Tell me in the comments section below! I always love to hear from you!